As you continue to improve your business, I want to share a tool in the toolbox that really enhances the staff and client experience: an appointment scheduling system. Many businesses already use this tech including banks, doctors, dentists and more. Now it’s time for you to introduce this to your business. You and your staff will love the time blocking that makes your day more sane and predictable. Your prospects, CIOs, and clients will also love the 24/7 accessibility to your calendar to schedule a meeting as it eliminates the back and forth messaging. You just need to tackle the effort of designing the time blocks. First, you should choose the scheduling tool that is user friendly, integrates with your calendar, and is affordable. Find an appointment scheduler that is user friendly and easily integrates with your calendar. Then, you will work with a trust staff person or coach to design your time blocks. For students of Strategic Coach, you would block client meeting times to fall into the Focus time period (Free, Focus, and Buffer). I segment the Focus time into Client Technical Work, Research, Business Strategy/Development and Staff Management. 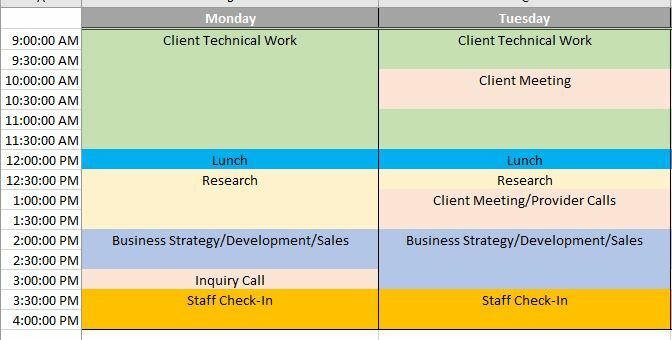 Client meeting time blocks are placed within the Client Technical Work time period (see example below). Finally, you will embed the scheduling URLs in your email signature, website, client portal, social media profile, and marketing communications. This tool is very instrumental. It will improve the prospect and client experience by giving them the freedom to schedule meetings anytime they want and eliminate the back-forth that occurs when scheduling. And it will allow you to honor your time blocking and maintain a healthy, predictable work schedule that your staff will benefit from. Good luck adding this tool to your toolbox as you continue to improve your business!